Definition at line 24 of file CQProgressItemText.h. Definition at line 26 of file CQProgressItemText.cpp. Definition at line 35 of file CQProgressItemText.cpp. Definition at line 40 of file CQProgressItemText.cpp. References FROM_UTF8, CCopasiObject::getObjectName(), CCopasiParameter::getValue(), mParameterValue, CQProgressItem::mpItem, and reset(). Definition at line 52 of file CQProgressItemText.cpp. Definition at line 58 of file CQProgressItemText.cpp. References CCopasiParameter::DOUBLE, CCopasiParameter::getType(), CCopasiParameter::INT, CQProgressItem::mpItem, mpSetValue, process(), setValueFromDOUBLE(), setValueFromINT(), setValueFromSTRING(), setValueFromUINT(), CCopasiParameter::STRING, CCopasiParameter::UDOUBLE, and CCopasiParameter::UINT. Definition at line 87 of file CQProgressItemText.cpp. Definition at line 92 of file CQProgressItemText.cpp. 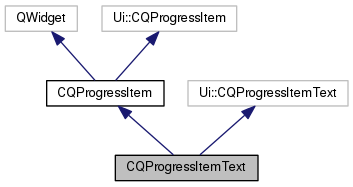 Definition at line 102 of file CQProgressItemText.cpp. References FROM_UTF8, mParameterValue, and CCopasiParameter::Value::pSTRING. Definition at line 97 of file CQProgressItemText.cpp. Definition at line 38 of file CQProgressItemText.h. Referenced by initFromProcessReportItem(), setValueFromDOUBLE(), setValueFromINT(), setValueFromSTRING(), and setValueFromUINT(). Definition at line 37 of file CQProgressItemText.h. Referenced by process(), and reset().